Photo of 2015 Subaru Legacy by Vince Taroc. A crop of 2015 model-year mid-size sedans that offer greater fuel efficiency and more safety features than ever before are expected to return less residual value to buyers in part due to higher supply volumes, according to a Black Book forecast. Manufacturers of four of 10 popular models offered next-generation models for the 2015 model year, including the Chrysler 200, Hyundai Sonata, Subaru Legacy, and Toyota Camry. Carryover models that have entered a new generation since the 2012 model year include the Chevrolet Malibu, Ford Fusion, Honda Accord, Mazda Mazda6, Nissan Altima, and Volkswagen Passat. Intense competition in the past four years in this segment has created a higher supply of the vehicles in the marketplace that should dampen residual values, according to Ricky Beggs, Black Book's editorial director. "For almost four years now, we have been watching used supply volumes increase knowing that actual used values would gradually decline," Beggs told AutomotiveFleet.com. "This has occurred. As far as the mid-size car segments, this is a very competitive segment with many players and significant volumes. It is hard to make one model stand out from the remaining competitors." Black Book segments the category into "entry midsize car" (EMC) and "upper mid-size car" (UMC). The Chevrolet Malibu, Chrysler 200, and Ford Fusion fall into the first segment, while the remaining vehicles fall into the second one. Black Book's EMC forecast for 2015 came in at 45.6 percent, compared to 48.2 percent in the segment a year ago. The UMC segment came in at 46.6 percent, compared to 50.7 percent at the start of 2014. The percentages show what percentage of the vehicle's purchase price will be recouped when it's sold after a three-year holding period. 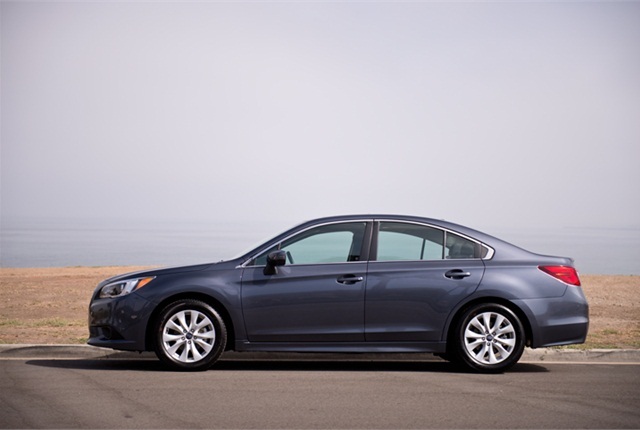 In the forecast, only the residual value forecast for the 2015 Subaru Legacy is projected to rise to 55.1 percent compared with 54.5 percent for the 2014 Legacy. Other forecasting data for 2015 includes the Malibu (43.2 percent), 200 (40.3 percent), Fusion (44.2 percent), Accord (48.8 percent), Sonata (43.5 percent), Mazda6 (46.5 percent), Altima (44.1 percent), Camry (46.6 percent), and Passat (44.3 percent). In 2014, Black Book's forecast for the 2014 models included the Malibu (44.3 percent), 200 (41.8 percent), Fusion (49.8 percent), Accord (52.5 percent), Sonata (52 percent), Mazda6 (46.7 percent), Altima (50.6 percent), Camry (49.3 percent), and Passat (44.5 percent).